Get Men’s Valentine’s Day Outfits for Valentine’s Day at Dallas Vintage Shop’s Huge Selection of Valentine’s Day Clothing and Costumes. We have Valentine’s Day Gentleman’s Attire for the Romantic Fools, Sweetheart Banquets, Daddy-Daughter Dances and Special Occasion Dinner Dates for Feb. 14th. Find Exceptional Quality & Creative Outfit Ideas. We have Red, White or pink Suits, Hats, Ties, Suspenders, Blazers, Tuxedos, Jewelry & Accessories you cannot find anywhere. So many choices and mix & match options. Put together simple, subtle or flamboyant Valentine’s Day Gentleman’s Clothing combinations that are perfect for any Romantic Valentine’s Day Event. 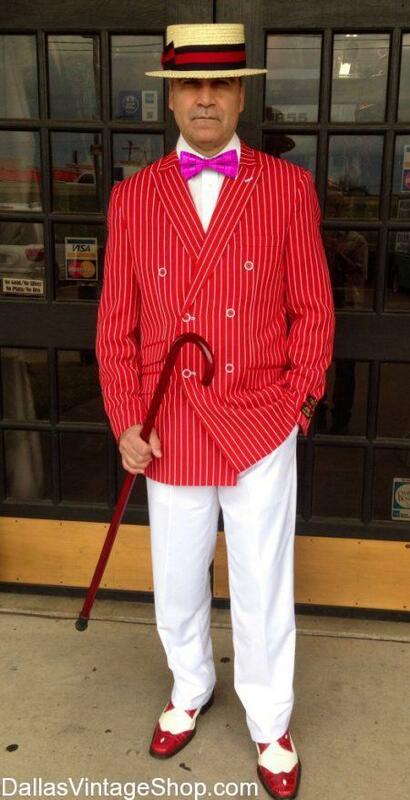 Take a look at this ‘Lady Killer’ Valentine’s Day Men’s Fashion Ensemble. Get Valentine’s Day Men’s Fashionable Clothing at Dallas Vintage Shop. Nobody in the Dallas area has more Handsome Valentine’s Day Men’s Fashions. Go Subtle or go Bold. Our Valentine’s Inspired Collection of Formal & Casual Attire comes in all the Valentine’s Day Colors that will amaze you. Get Tuxedos, Tail Coats, Ascots, Ties, Bow Ties, Pocket Squares, Vests, Suits, Bow Tie & Cummerbund Sets, Suspenders, Hats, Caps, Stunning Blazers and Avant-garde Outfits that are perfect for Sweetheart Banquets, Proms, Dinner Dates & Daddy-Daughter Dances. All come in Reds, Pinks, Whites and combinations of Valentine,s Day Colors. We even have the perfect Valentine’s Day colored Shoes, Walking Canes and Top Hats in stock for men. You will never find more options for Valentine’s Season Events than we have, and we keep completely stocked all year round. Romantic Gentleman’s Valentine’s Attire Dallas Menswear Collection. We have all the Romantic Gentleman’s Valentine’s Attire Dallas needs. Get complete Valentine’s Outfits or just the Suits, Blazers, Tuxedos, Vests, Quality Hats, Shoes, Ties, Bow Ties, Pocket Squares & Suspenders you need. We even have Men’s Valentine’s Broaches and other Jewelry. Get Classic Vintage Fashions or Avant-garde Modern Style Clothing in all of the Traditional Valentine’s colors. Create Supreme Quality, Celebrity Status Outfits or get just the Moderate & Economy Priced Clothing and Accessories you want. We have the largest Valentine’s Day Clothing Collection in North Texas or anywhere. For all the Romantic Gentleman’s Valentine’s Attire Dallas needs, come to Dallas Vintage Shop. We have the latest Valentine’s Fashions to Vintage Blazers, Ties, Suits and other Accessories that will make the Valentine’s Day impression you want. Posted in Valentine's Day Men | Comments Off on Romantic Gentleman’s Valentine’s Attire Dallas Menswear Collection. Gangster of Love Outfit in Stock: Men’s Valentine’s Clothing Store. This Gangster of Love Outfit is in Stock in our Men’s Valentine’s Clothing Collection. Buy entire outfits or just the pieces you want. These also make great Valentine’s Day Gifts. For the Valentine’s Season we’ve turned into the Metroplex Men’s Valentine’s Clothing Store. We have Unlimited Valentine’s Day Outfits. 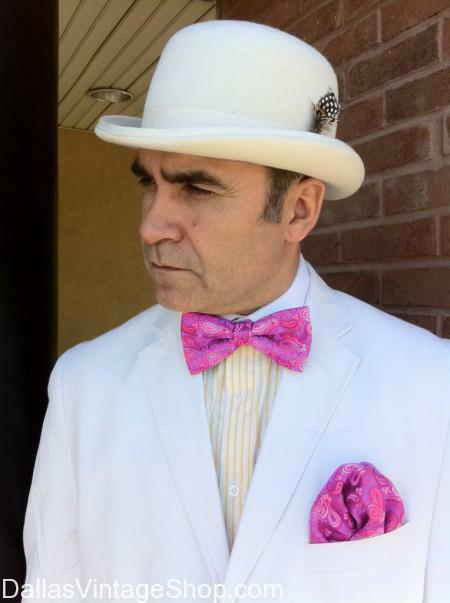 Find Valentine’s Gangsters, Flamboyant Blazers, Romantic Formal Attire, Valentine’s Colored Fedoras, Valentine’s Colored Ties Bow Ties & Pocket Squares, Vests, Suspenders, Suits and a Huge, Huge Selection Men’s Valentine’s Gift Ideas. Posted in Valentine's Day Dress Up, Valentine's Day Men | Comments Off on Gangster of Love Outfit in Stock: Men’s Valentine’s Clothing Store. Welcome, all you Valentine’s Day Casanovas. We are DFW’s HQ for Valentine’s Outfits you cannot find anywhere else. You will not believe the quantity & variety of Valentine’s Outfits that will make an Unforgettable Impression. Come See our Racks & Racks of Perfect Valentine’s Day Dinner Attire, Killer Suits, Flamboyant Blazers, Tie & Bow Ties with Pocket Square Sets, Suspenders, Vests, Vintage Attire and Fantastic, Unique, Thoughtful Valentine’s Day Gifts. And all in in Valentine’s Perfect Colors. You will find an abundance of Extraordinary Valentine’s Men’s Clothing in Dallas at our unbelievably well stocked shop. We have all the best outfits for any special Valentine’s Day events that you have ever seen or imagined. Get Complete outfits or just the clothing or accessories you need. Valentine’s Men’s Clothing. Our shop has the most Unique Men’s Collection of Valentine’s Themed Clothing, Suits, Blazers, Ties, Bow Ties, Pocket Squares, Vests, Suspenders and an enormous variety of Hats, Caps, Pocket Watches & More. Come get all the Prefect Valentine’s Day colors & fashions you need. We have unique, flamboyant or subtle, rich outfits that will make just the right impression. Get Valentine’s Sugar Daddy Attire or Subtle, Sophisticated Valentine’s Day Men’s Outfits or just the accessories you need. We have plenty to choose from. We have the Valentine’s Day Dallas Men’s Outfits you want. There are more Unique Flamboyant Valentine’s Outfits and Ideas than you have ever seen in one place. 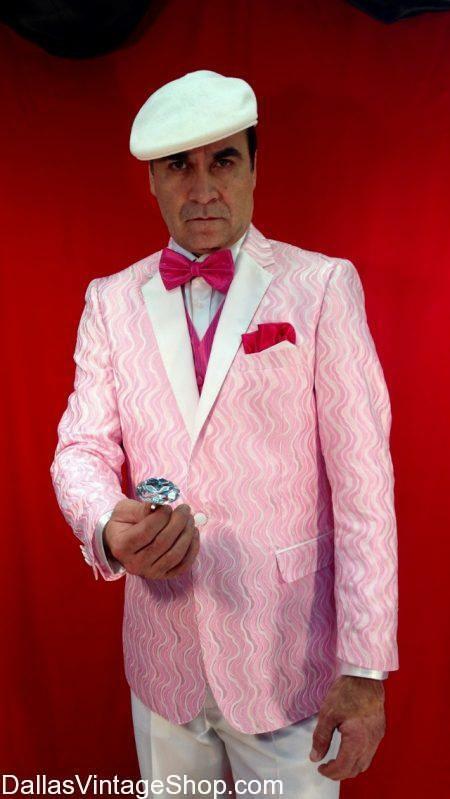 We have in stock this amazing Pink Pin Stripe Suit, Pink or Red or Red & White Blazers, Ties & Bow Ties, Pocket Squares, Vests, Suspenders & Pink or Red Fedoras & other Hats. You will find Men’s Valentine’s Gifts Galore! Get subtle or get outrageous clothing that will make your Valentine’s Day wonderful. We have Racks and Racks of Men’s Valentine’s Day Clothing at our Men’s Valentine’s Day Clothing Dallas Store. You won’t believe the Volume & Diversity of Styles from Vintage to Modern Valentine’s Day Fashions. Largest Variety Men’s Valentine’s Day Clothing in Dallas. We have the most amazing Ideas, Complete Outfits or just the Killer Valentine’s Day Romeo Blazers, Ties, Suits, Hats & anything Valentine’s Men’s Attire or Accessories you could possibly need. Men’s Valentine’s Dressy Attire, Red & White Pin Stripe Suit, Men’s Ties, Hats & Broaches In Stock, In Abundance. Gentlemen, Get Your Valentine’s Day Swagger On! We have endless choices and unique Men’s Valentine’s Dressy Attire. We have enough for everyone in the DFW area. Get all your Men’s Valentine’s Day Dressy Attire and Valentine’s Gifts, all in one place. We have many Valentine’s Day Suit Suggestions, the Perfect Fashion Ties & Pocket Squares for the right Valentine’s look, Valentine’s Dress Up Vests, Suspenders & a lot of great clothing & accessories ideas in stock. Find Head to Toe Complete Valentine’s Day Outfits or just the Blazers, Bow Ties, Vests, Hats, Suspenders & Accessories you need. Posted in Valentine's Day Men | Comments Off on Men’s Valentine’s Dressy Attire, Red & White Pin Stripe Suit, Men’s Ties, Hats & Broaches In Stock, In Abundance. You are in Valentine’s Day Men category.